Hi, everyone. One of my goals for 2015–yup, sadly, still working on promises from yesteryears because that’s the kind of special slacker I am–was to come up with a new feature for Grinding Down, and it only took me about eight or nine months into 2017 to figure out what I wanted though it does kind of go hand in hand with resolution #3 for this year about clearing out some of my Steam backlog. Either way, I done did it. Welcome to My Laptop Hates These Games, wherein I take a real short glance at games I tried to run on my less-than-steller ASUS laptop from 2010-ish, which is totally not built to play big games, but has, in the past, been fine with things like Broken Age, Transistor, and Gone Home. I was even able to run meatier operations like Red Faction: Armageddon and Bulletstorm, just with the settings turned super low. Some games operate better than others, and some simply don’t run at all. At least through this feature, I’ll find out if they work or don’t work sooner than later, and my goal is to present to you the exact experience I had, from hitting the executable to deleting all the files. I’ve never even played a single second of The Legend of Zelda: Wind Waker–I know, shame on me–but I already completely understand that this is the look and feel Maui is going for in its execution. This is a free action-adventure game based on Hawaiian mythology, which is something unique to the videogames playing field. I got through the tutorial just fine, learning how to switch my faith to different gods for unique powers, but then the mission where you need to find a banana brought everything to a crawl stuck inside a glacier covered in molasses. Unfortunately, there are no settings to change things, and so this got deleted without ever finding that lost banana. Another freebie on Steam that I probably installed because it kind of looked like Thomas Was Alone. Unfortunately, I can’t say if Escape the Game: Intro played the same way or not because, after seeing the title screen and clicking start, the game does a fake crash à la Fez…ironically leading to a real crash to desktop. I was able to replicate this three times before I gave up. I guess in my own special way I did manage to escape the game. My Time at Portia looks real fine. My love and fascination for quirky farming simulations continues to grow, having enjoyed Stardew Valley and Slime Rancher a whole bunch recently, and this one looks to be almost a mixture of the two styles. It’s set in a post-apocalypse setting, but a splashy, kaleidoscopic one. The player starts a new life in a town on the edge of civilization called Portia by building a workshop and creating helpful items with relics from the past. The goal of the game is to make the workshop as big as possible…I think. Even with the graphic settings turned to “fastest,” this was next to impossible to play. I knew I was in for a rocky time when the in-game cutscene staggered forward at a crawl. Gaining control of the main character was worse. Here’s hoping that this too comes to consoles like similar titles as of late. My Laptop Hates These Games takes a quick look at the titles that kind of, only sort of run or don’t run at all on my ASUS laptop. Here’s hoping that some of these, specifically the ones that looked interesting, come to console down the road. Y’know, those gaming machines where nothing ever goes wrong and every game runs perfectly without ever crashing or freezing or glitching out. Maybe I’ll play these there or in 2056 when I get a new laptop that is, even at that point, still somewhat obsolete. I want to play Stardew Valley all the time, but I don’t have all the time to play Stardew Valley. Yup, it’s a double-edged sword. Or perhaps a tilling grub hoe would work better in this instance. Anyways, I’ll do my best to explain. Stardew Valley is capable of devouring hours of your life. In your mind, you might think that this is the sort of game you can sit down and play for a little bit and then stop. That is false. Oh so wrong. It is amazingly difficult, at least for me, to not continue into a new day after the rooster crows and I check the TV for the weather report, my fortune, and if any new kitchen recipes are available to learn. I don’t even have a kitchen yet. If I step outside my house, it is inevitable that I’ll see something that needs my attention, whether there is a letter in the mailbox or crops to harvest or just the fact that my kitty cat’s bowl is empty. Unlike Animal Crossing: New Leaf, where a day in-game was identical time-wise to a day of real life, one could play a number of in-game Stardew Valley days over the course of a few hours. With so many things to do, it’s easy to lose yourself in your pixelated farm. I won’t go into much detail about how Stardew Valley plays, as I think I covered most of it in my last post. In terms of progress on Perdido Farm, I just finished the summer season of my first year in Pelican Town, and autumn is now working its magic spell on me. Falling leaves and swirls of reds, oranges, and yellows–it really is the best season, and I’ll hear no other argument about it. I’m excited to grow some fall-only crops, which will help in my progress to upgrade the community center. Bring on all the gourds and stalks of corn and weird, other worldly mushrooms. I should also begin preparing for the winter, which is most likely a season where you can’t grow a ton of crops. Hmm. However, I’d really like to talk layouts today. I’m terrible at them, as well as terrible about planning ahead. This is definitely the case in Stardew Valley, but I’ve also run into the same problem in games like Terraria, Minecraft, and Fallout 4. You’re given all these elaborate and open-ended tools to create things–farms, houses, settlements, etc.–and then it is up to you to either get creative or smartly efficient. In fact, my favorite update to Minecraft was when they added in NPC-occupied villages, so that I never had to worry about constructing a functional house for myself. The answer is always squatting, I guess. I mean, I’m okay on the creative side of things, and if you don’t believe me please come over to my house in Fallout 4‘s Diamond City to see how many paintings of cats I was able to hang up on the walls. Unfortunately, went it comes to farms, efficiency is key. Sure, there’s merit in being creative and laying everything out in an eye-pleasing, organized manner, but you need to place a greater emphasis on ensuring your crops grow and can be cared for with ease. For Perdido Farm, this is not the case. I just sort of dug up the ground directly in front of my house, built some stone paths around it, and threw scarecrows and sprinklers in probably not the best spots because…well, I got the items and wanted to immediately place them into action without pausing to think for a split second where they could best be used. And now I feel somewhat stuck in what I’ve started, as it can be dangerous to unearth some of the items you placed and replace them. If I was better at all this, I’d have planned out my farm from day one and created something much more effective. I mean, look at some of these things. Perhaps this is something I can focus on in the winter, in preparation for an even better spring harvest. Y’know, when I’m, at the same time, trying to worm my way into Maru‘s heart, of which, I am currently rocking four hearts with her. Also, if you are curious where that nifty turn of phrase in this blog’s title came from, check out the poem “Ode to Autumn” by John Keats. I don’t have the longest or most memory-filled history with the Harvest Moon series, only entering the franchise a few years back with titles like Rune Factory: A Fantasy Harvest Moon and Harvest Moon: Grand Bazaar. I wasn’t very impressed, though I wished to be. On paper, these sound fantastic and easy to lose hours of time to, but they both began so slow and challenging that they turned into non-starters. I even came back to the well for a third time with Harvest Moon: Back to Nature, but that didn’t last long as I quickly realized making progress was still going to be a painstakingly lengthy task. Sure, you could make the comparison to real life, that managing and seeing an actual farm profit is no cake walk, but I’m not interested in a one-to-one simulator. It really shouldn’t take months to acquire a single cow, and then more months for the cow to like me enough to provide milk. Still, being a massive fan of Animal Crossing and a few farming simulators that will remain nameless, I continued to scan the gaming horizon almost daily for something of this farming/dating sim ilk that will satisfy my curiosity. Which brings us to Stardew Valley, the talk of the Internet town over the last week. Amazingly, it’s developed by one person, Eric Barone under the handle ConcernedApe, and published by Chucklefish, and is receiving a lot of praise and press. I asked Greg Noe to sell me on the game as I know he’s a big fan of Harvest Moon, and he straight up gifted me a copy. Bless you, Internet neighbor. But if your farm is to be a raging success, you can’t give away the goods all time. The story is one we’ve heard before: you’ve inherited your grandfather’s old farm plot in the titular Stardew Valley. After slumming around in a corporate workspace and feeling a severe disconnect with the world, you grab a few essential tools, a handful of coins, and make your way to the farm, which I named Perdido Farm after China Miéville‘s New Weird novel just because, to begin your new life. However, it’s not going to be easy, especially under the shadow of the Joja Corporation. Plus, a large part of the nearby Pelican Town is in disrepair, so not only do you have to make this plot of land of yours a success, but also rebuild the town from the ground up. Graphically, it’s pixel art, but it’s sweet, delicious pixel art. Really colorful and fun, and more detailed than you might assume, especially once you get inside some of the shops and homes. It’s a sharper SNES title, with a slicker interface. I got to make my avatar in my own likeness (see above), and the menus are easy to navigate through. Call me silly and maybe this has more to do with me playing a lot of open-world games as of late, but I wish there was a way to mark a location on the map and follow directions to it. Like I said, silly. Well, I’ve put about two hours in Stardew Valley so far, which is equivalent to five or six days in-game, and I can safely say that this gets things going much faster than other Harvest Moon titles. Again, there’s a lot one can do during the day, and a part of me wishes time moved slower or the character had a faster walking speed, because it can take a decent chunk of his day simply going from place to place. You’ll want to clean up debris on your farm, plant crops, sell materials, meet people, take on quests, and so on. When I say there’s a lot to do, there’s a lot to do, and I don’t have the space here to list everything out. Instead, I’ll focus on a couple of big aspects. First, I really like the there’s a quest log. That might seem like a small detail or even just the norm these days, but previous Harvest Moon games didn’t have it, which often lead to me not knowing what to do next or give me a goal to focus on while waiting for those parsnips to grow. Items and tools and everything else contain detailed information, which is handy, and the map is intimidatingly large. I’ve not yet met all the citizens of Pelican Town–how do you greet the wizard?–so I’m not ready to pick a potential love interest or discuss how the dating sim elements work. Lastly, the idea of rebuilding this town and doing side quests from the bullet board by Pierre’s shop is hitting the nail on two different heads: my fondness for quest boards, as well as watching castle headquarters grow in Suikoden and Suikoden II. I don’t understand the fishing minigame. Wait. Let me rephrase that. I understand the mechanics behind it, but I don’t understand it as a whole. It seems both challenging and random, and at the same time I’m not desiring an easy button press like in Animal Crossing: New Leaf, and everyone should already know my feelings on really bad fishing minigames. I just worry that fishing can be too much of a risk or time waster despite obviously containing some great rewards. Anyway, I’m eager to get back to Stardew Valley tonight and continue making progress, especially with those parsnips. It’s definitely one of those “one more day” kind of games, where one more day actually results in you playing for several more hours. If you don’t hear from me after a bit, check the farm. A few weeks back I listened to a bunch of Retronauts podcasts, and one of them was devoted to musing and gushing about the entire Harvest Moon series. Well, as much as they all could. I noticed they neglected to touch upon Harvest Moon: Grand Bazaar, the only one I’ve actually played up to this point. But since then, I’ve had the itch to either return to that DS title or try another in the franchise; the fact that you do a lot of farming for special plants and ingredients in Disney Magical World possibly also played a part in pushing me forward. Fortuitously, there was a PSN sale on a bunch of old PS1 classics some time back, so I grabbed Harvest Moon: Back to Nature for like a buck, planting the seed. 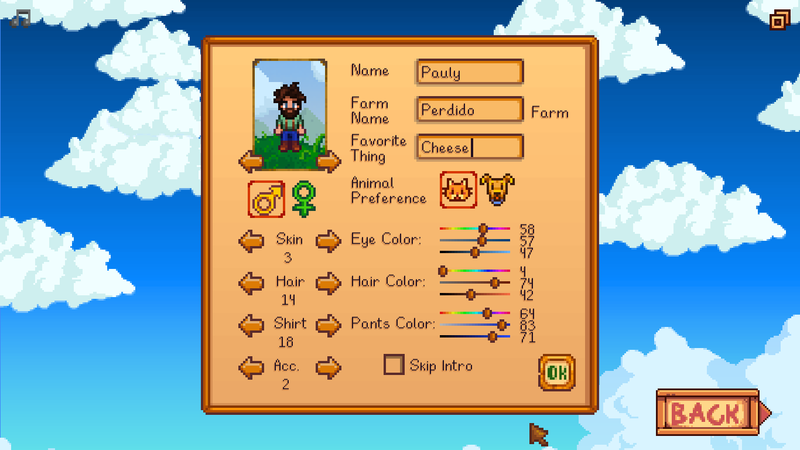 Well, in true Pauly fashion, this newly acquired farm is not off to a great start. But how did I come to be its caretaker, you ask? Via a somewhat somber opening cutscene. As a young lad, your summer vacation with your father is suddenly cancelled, and so you end up paying your grandfather–and his farm–a visit in the countryside. Things move quite differently out there. You also meet a girl, and, together, the two of you sing songs and play in the fields. You make a promise to her that you’ll be back one day. It has now been ten years since that summer; sadly, your grandfather passed away and left you the farm in his stead. I’ve only played a week and a few in-game days for Harvest Moon: Back to Nature, but I’m finding it extremely slow-paced. More so than Grand Bazaar. Granted, I understand that these games are built upon routine, but it seems to even be an uphill climb to begin putting that routine into place. You begin day one on your grandfather’s farm–which I decided to name Freaky Farm–with 500G, a bunch of obvious tools, and no animals other than your dog, dubbed appropriately Chomp. Well, I was terrified to spend all my money in one lump, so I bought nine cucumber seeds, cleared a section of the very cluttered farmland, and planted and watered them each day. Alas, I picked a little poorly, as cucumbers take a very long time to grow. Your initial tasks are not very obvious, and so you can end up wasting most of your day wandering around the farm and the nearby village. Wait, wasted isn’t the right word. Instead of farming and making money, you’re instead focusing on speaking with the local townsfolk, hearing about their problems and triumphs, and reacting accordingly. So far, a strange man has appeared in town to the policeman’s detriment. I also noticed that many customers are taking advantage of the supermarket’s clerk, using credit to “buy” things and never fully pay for them. A big part of the Harvest Moon games are structured around relationships, and growing a friendship or love thingy takes as much time–or even more–as that 3×3 field of potatoes. I also attended some kind of rose festival, where a bunch of girls did a dance. Also, I’m not even joking when I tell you it took me five days to figure out how to place produce in your bin, which is the only way to sell items and make some money; I kept throwing it from the wrong angle, which I guess destroyed the item. And that’s it…so far. I imagine once I get more animals, more plants, and more things to do, I’ll have to switch the routine up. But for now, this at least earns me around 300 to 500G every day. Unfortunately, everything in the game is costly. I think a cow alone is like 4,000G. So I have a ways to go still. There’s so much I want to buy though: cows, chicken, brush for horse, bell, different seeds, etc. I can most assuredly count on one hand the number of times I’ve looked at the manuals for the numerous digital games I’ve purchased, but Harvest Moon: Back to Nature‘s manual reading is a must for all newcomers. I can’t stress that enough. The game does not hold your hand and spell everything out; it’s about learning, taking things day by day. However, I’m also using this guide from time to time, which taught me what fatigue looks like, as well as the best way to save money and level up your tools.